Have you ever wanted to create your very own major motion picture? Click here to play! Live out this dream in Silver City. If you can make the next big blockbuster you'll definitely reap the monetary rewards in this fun slot game! To get things started, you'll need to cast your leading lady. The actress symbol not only substitutes for most other symbols, but she will triple prizes when she appears on a winning combination. Next up, you'll have to find a director worthy of handling your masterpiece. 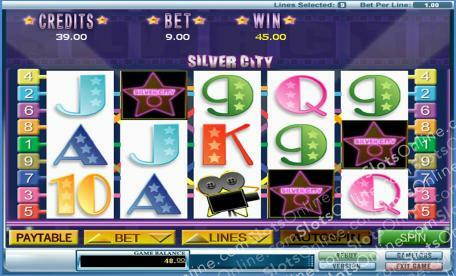 Spin one to five directors across a pay line and you will get up to 1000 times your line bet. There are plenty of other symbols to help you in your quest to create the next big movie, including cameras, bullhorns and director's chairs. You'll definitely want a star on the Walk of Fame. Spin two to five of these golden symbols and you'll get up to 200 times your total bet. It's lights, camera, action in this exciting game that will see you making a fortune if you can produce a Silver City classic. The golden star on the Walk of Fame acts as a scatter. Spin two to five of them anywhere on the board and you'll get 1, 5, 20 or 200 times your total bet. The beautiful actress is a substitute. This gal will replace all other symbols except scatters to help you create more winning lines. If she appears in a winning combination your prize will be tripled.